Ampthill secured a bonus point win over Sedgley Park with the last play of the game as they ran out winners by 27 points to 8. With a raft of changes following the defeat at Leicester Lions, it was perhaps not surprising that Amps looked disjointed in the first half, especially given the aggressive and physical opposition. The second half performance was much improved, with more cohesion, but it wasn’t a day for backs’ flair. 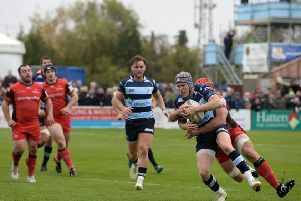 The hosts took the lead in the 13th minute when fly-half Joseph Tarrant kicked a straightforward penalty goal after the visitors were penalised at a breakdown. Alexander Bloisi increased the home side’s lead on 17 minutes as Sedgley failed to stop a catch and drive, with Tarrant adding the extras from the touchline. The visitors then opened their account in the 26th minute with a penalty goal after Ampthill were deemed offside in midfield. The remainder of the half saw Amps on the attack, but stout defence from Park and poor finishing from the hosts left the scoreboard team untroubled. The hosts stepped up a gear at the beginning of the second period; ball was faster as breakdowns were being cleared more effectively, while Sedgley began to incur the displeasure of the referee. On 49 minutes, a second catch and drive saw open side flanker Joseph Bercis score his 16th try of the season, followed in the 61st minute by his 17th after another similar lineout and maul – both tries going unconverted. With the visitors unable to field a qualified front row after injury and a yellow card, uncontested scrums saw them produce their best period of the game. This eventually culminated in a 78th minute unconverted try for their left winger. The hosts weren’t finished, however, and – with the last play of the game – centre William Goodge crowned an improving debut with a try to secure the bonus point . Ampthill director of rugby Mark Lavery said: “This was a much improved defensive performance over the previous two games.